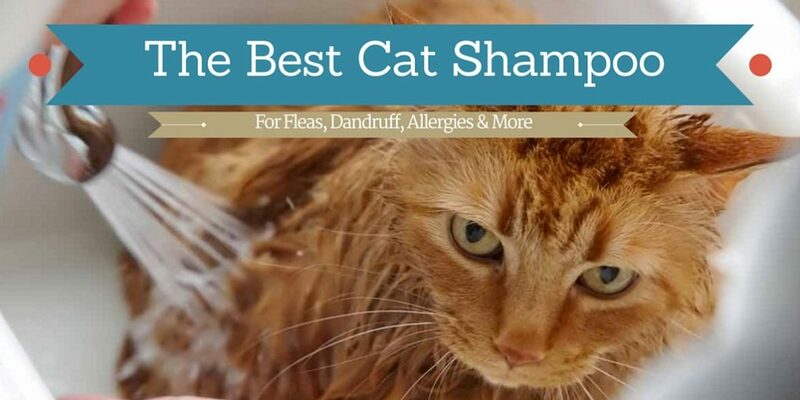 →The Best Cat Shampoo for Fleas, Dandruff, Allergies, and More! Bathing your cat is not something most cat owners need to do often. As such, you may not know much about cat shampoo. Cats usually HATE water with a passion. They'll drink it, but most felines will do whatever they can to keep water from touching their coat. Your kitty is also naturally equipped to clean their coat. Your cat's tongue, teeth, and saliva were designed to handle all the rigors of feline hair maintenance. You probably noticed your cat doesn't have odor issues like a dog would. Our furry friends know how to handle their hygiene. Still, you’ll find a time where they will get into a mess. And this mess will require immediate cleaning. Tongue and teeth just won’t suffice. Cat owners will eventually need to give their cat a bath. Best Cat Shampoo for Dandruff? So What About Waterless "Baths"? First and foremost – do NOT use people shampoo. Ever. The dyes, ingredients, and more can lead to painful skin conditions for your cat. If an emergency arises and you don’t have any cat shampoo on hand, then you should wash your cat with water only. Baby shampoo can be used extremely sparingly, but we recommend against even using baby shampoo. Water is better than any human shampoo on a cat’s coat and skin. As there are many different breeds of cats, there are also many different types of cat shampoo. Different cats suffer from various conditions (like humans), so there are different cat shampoos to do different things. The type of cat you're taking care of and their needs will determine what kind of shampoo you'll need to clean up that furry friend of yours. The best overall cat shampoo we tested was Magic Coat Cat Tearless Shampoo. If you're looking for a shampoo that'll clean your cat, get rid of excess odors, and is gentle – then Magic Coat is what you're looking for. This formula won't irritate your furry one's eyes in the bath. Magic Coat is all-natural and the perfect choice for an owner who found their fur ball in a mess. For most cat owners, this formula will do the trick. Quick tip: No matter how good a formula is, you'll want to make sure and avoid getting the shampoo in your pet's ears, eyes, mouth, or nose. Fleas are a pain. Not only will fleas begin to drive your cat up a wall, but they often find their way onto humans, too. There are some popular home remedies for getting rid of the fleas inflicting misery on your cat. However, there have been cases of adverse reactions to many of these remedies. Most vets agree a cat shampoo created for flea control is a safer solution. We found the Natural Chemistry Cat Shampoo to be incredibly effective in removing fleas from your feline. The formula is all-natural and sensitive to your cat's skin. You won't have to mix this solution, either. P.S. : This shampoo offers mites and tick control, too. The older a cat gets, the more likely he or she is to develop skin and coat conditions. Dandruff, dry skin, and a compromised coat can bother cats as they age. One easy way to combat this minor health issue is by using a dandruff shampoo when your pet takes a bath. The best cat shampoo to alleviate dandruff and dry skin hands down is Espree Natural Silky Show. 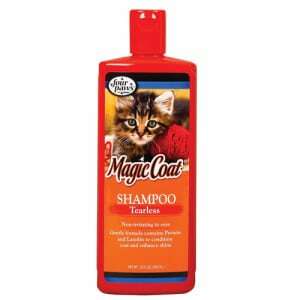 The formula is designed to offer moisture to brittle coats and soothe a cat's skin. Chamomile and aloe vera ensure your kitty's coat will come out of the bath looking good. Just like humans - many cats suffer from allergies. If your cat struggles with allergies on occasion, you'll want to use a cat shampoo that is hypo-allergenic. This ensures your cat won't have any further issues in the bath (other than dealing with the water). 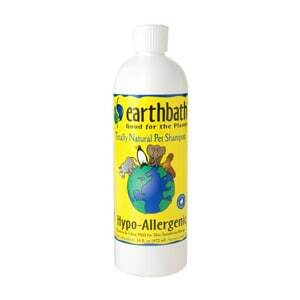 One of the best shampoos for cats that suffer from allergies is Earthbath Hypo-Allergenic Cat Shampoo. The hypo-allergenic formula was created with all natural ingredients to ensure no allergic reactions for our felines. One fact of a cat's life is shedding. Almost all cats (except for a few breeds) shed. Due to this shedding, your furry one swallows a lot of his or her hair in the process of cleaning. This leads to hairballs galore. And if you're anything like me - then you're not a big fan of hairballs. 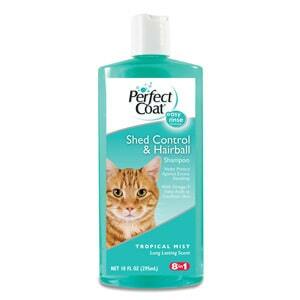 If your cat suffers from excessive shedding and hairballs, then we suggest 8 In 1 Hairball Control Shampoo. The formula in this shampoo was designed to significantly reduce cat shedding. Less shedding means fewer hairballs. This product also helps detangle a cat's coat. Quick Trick: If shedding and hairballs are a problem – remember to brush your feline between baths. This will help rid your furry friend of excess hairs. Some cats just refuse to take a bath. While most won't like getting into the water, a majority of our fur balls will eventually accept the plunge into the tub. If your cat simply refuses to get wet, then you might have to invest in a waterless shampoo. Our favorite waterless product is Earthbath All Natural Hypo-Allergenic Cat Grooming Foam. The Earthbath formula was created to leave the coat shining and eliminate hairballs. It also leaves your cat with a fresh smelling fragrance. Kittens do not have the same needs as adult cats. This is true from a nutritional aspect and when bathing. You'll need an extremely mild shampoo to compensate for the gentle skin of a kitty. We love Espree Natural Kitten Shampoo when washing down a dirty kitten. The formula is tear-free, gentle, and hypo-allergenic. A kitty would never suffer from irritation or coat dying when bathing with this shampoo. The best cat shampoo will really come down to the needs of your furry friend. Each cat will benefit from a different type of shampoo and some will benefit more than others. While bathing your furry one is important, especially when they get into a mess, you’ll want to be careful. Only bathe your cat when truly needed. Too many baths will cause damage and irritation to your their fur, coat, and skin. Do it in moderation though, and you’ll have one happy kitty!